945-1055 – Baghdad, capital city of Islam, was captured by Buyids from north-central Iran. The reduced role of caliph to that of a religious figurehead only, established the future developments that emerged as troubles in 19-21st centuries. Political power remained in Buyid's hands for almost a hundred years. 1092 -- Not from an Iranian origin, but ruling in Iran for Iran, Malek Shah of Seljug dynasty, assisted by and in consultation with his intelligent Vazir (Minister) namely Nizam-ol-Mulk, opened a new era in Iranian history. Under guidance of Nizam-ol-Mulk Malik, Shah controlled virtually the entire eastern segment of the region, from Syria to Afghanistan. Nizam-ol-Mulk the author of a famous book on politics and government system, named Siyasatnameh, set significant standards in ruling arena. Court procedures, systematic decision-making processes and restriction of arbitrary rules were discussed in his book. He established Nizamieh Schools, teaching politics and other sciences in the major cities, which under Seljuq rule increased public awareness. He was the benefactor of both Ghazali and Khayyam. 1048-1122 --Mathematics, astronomy, poetry, literature were the famous Omar Khayyam’s line of expertise. With precise calculations he created the most accurate calendar in the world. 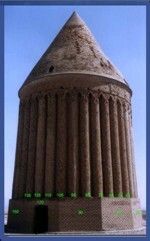 He helped building an important observatory in Isfahan. His philosophical quatrains named Robaiyat gained him such fame that a famous British, Fitzgerald, in 19th century translated them into English. Khayyam’s poems consecrate the divine gift of love and life. Khayam's Robaiyat has since been translated into many languages. 1058-1111 – Ghazali was recognized as the most prominent individual to discuss rational interpretation of existence, mystic and spiritual subjects. He was also a prominent theologian of his time. Gazali and Ibne Sina (Avicenna) represented two opposite views. Sufis strive for a deeper understanding of life and a closer communion with God through meditation, inner self-examination and the rejection of worldly possessions, Gazali tried to depict such moral. 1206 -- Mongol clans united by Gangis Khan, attempted to conquer the world! 1220 -- Unparalleled brutality, burning, mass killings and destruction came to Iran with the advent of Gangis Khan and his Mongol horde. One of the worst catastrophes in the history of mankind. As a result of this catastrophe, North Eastern province of Iran went under an extensive destruction. Hulagu Khan, erased almost every major city, destroyed libraries and hospitals and slaughtered almost the entire population. The death toll estimates ranged in the millions. But Iranians and Iran did not all die, they converted Mongols to building rather than destroying. 1227 –The Divided Empire was inherited by Gangis Khan's sons. 1258-1353 --Abbasid Caliphate came to an end following the invasion of Baghdad by Mongols in 1258. The Il-Khanid dynasty gained control of the segment of the Mongol Empire covering Iran. 1271 --Book of Travelers by Marco Polo on his way to China describes Mongols' savagery, brutality and truculent behavior. One more time, following "Tazi = Arabs" invasion, death and devastation came upon beautiful and prosperous Iran. 1207-1273 --The author of Mathnavi, the greatest mystical poet of Iran, an elevated Sufi and philosopher, Rumi, creates a master piece in poetry. In fear of Mongols, his parents migrated to Anatolia. His poetry and philosophy had a significant influence throughout the world. His rich poetry describes inner god in mankind by his mystic order found in self. 1274 --One of the famous observatories was built in Maragheh in the province of Azarbaijan by Nasir-ol-Din Tousi, following the invasion of Arabs and Mongols. He, as an astronomer and philosopher, developed the mathematical calculations showing the earth's revolution around the sun and its spherical shape and size. His work was later translated into Latin and postdated by some 200 years to that of Copernicus who is now considered to be the founder of modern astronomy and the originator of the idea of a solar-centered universe. 1213-1292 --Two of the most significant literary books written by a traveling poet, philosopher, political analyst, Sa'edi, are Bustan and Gulistan. Using meaningful poems, he exercised wide influence over the world from India, Central Asia and as far as United Nation in USA. "From the tomb of Sa'edi, son of Shiraz the perfume of love escapes - thou shall smell it still 1,000 years after his death." 1295 --Customarily in Iran, strangers who established governments in this land, have been converted to the Iranian traditions because of the powerful and rich culture of Iran. Ghazan Khan became the first Mongol of Il-Khanid who ruled in the name of Iran and accepted Islam. Prior to him, Greek, Arab and Turkic invaders were "Iranianized." Thanks to the Iranian scholar and prime minister Rashid-ed-Din, Ghazan started rebuilding the previous Mongol devastations. Jami' Al-Tawarikh attests to the Universal History written by Rashid-ed-Din, which is full of policies that brought about a short-lived period of peace and prosperity. During Mongols’ Iranian Empire, ideas and goods were exchanged with China and India. 1320-1390 --Sense of beauty, love of humanity, philosophy and knowledge of Arabic language characterized lyrical works of Hafez, one of the greatest poets of Iran. 1339-1432 -- The Jalayirids were a Mongol descendant dynasty which ruled west of Iran and a part of Iran at Iraq border. The Jalayirid sultanate lasted about fifty years, until disrupted by Tamerlane's conquests and the revolts of the "Black sheep Turks" or Kara Koyunlu. After Tamerlane's death in 1405, there was a brief unsuccessful attempt to re-establish the Jalayirid sultanate. 1405 --Timur (Tamerlane), of the Timurid dynasty origin, goes back to a Mongolian nomadic confederation, known as Barlas, following conquest of Central Asia by Mongols. the Barlas settled in Turkistan and intermingled to a considerable degree with the local Turkic and Turkic-speaking population. The Turco-Mongol leader, conquered much of Iran and its surroundings. Although brutal, he was also a patron of arts. Samarqand, his capital, gathered artists from all over Iran. 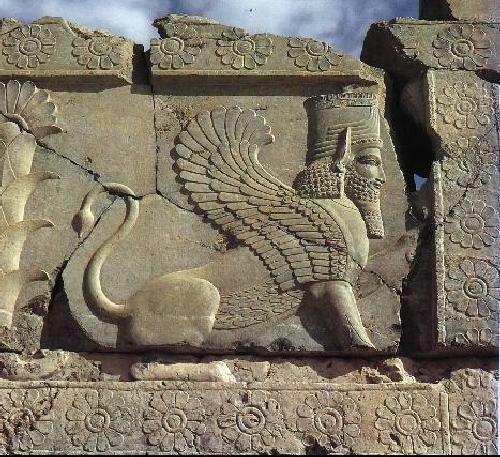 Following his death, his empire disintegrated, but his descendants ruled over various parts of Iran for almost a century. 1429 -- The credit of first calculating machine goes to Jamshid Kashani. He was a major mathematician, inventor of advanced number theory who participated in the astronomical activities at Samarqand. 1407-1508 -- Qara-Goyonloo and Aq-Goyonloo ruled in a Part of Iran. 1501-1524 --Following some nine centuries of fragmented rule by various dynasties, Shah Ismail I united all of Iran under Iranian leadership. He declared Shi'ism as the official state religion and virtually forcefully converted all of Iran and some surroundings under his control. This alone differentiated Iranians from the rest of the world practicing Islam; in particular from the Sunni Ottomans. The Safavid kings in general supported the Shi'ite clergy. 1587-1629 --Pinnacle of the Safavid dynasty bloomed during reign of Shah Abbas. Disciplined standing army defeated the Ottomans. In 1598, he chose Isfahan as his capital. A strong supporter of the arts, especially architecture, he adorned Isfahan with some of the finest monuments in the world. He built a number of mosques, schools, bridges and a major bazaar. Iran craftsmen and artists excelled in creating fine silks, cloths, porcelain, metalwork, calligraphy, miniatures and carpets. 1501-1722 --Ottomans in Anatolia and Mughals in India, the two contemporary Islamic rivals relied on Iranian artisans and poets for much of their arts and literature. Persian language became the first choice in both of their courts. Texts, miniatures, court items, painting preferences were almost all written in Parsi or were influenced by Iranian culture. India also adopted Iranian cultural and administrative skills, although it was later colonized by British. An Iranian architect named Ostad Isad built Taj Mahal which is significantly influenced by Iranian designs. 1722 --During Shah Sultan Hussain a chieftain and a vassal of the Safavid from Afghanistan, Mahmoud Khan, captured Isfahan, encountering virtually no resistance, ended the Safavid dynasty. 1729-1747 –Nader Shah, an officer of the Safavids, expelled the Afghans and reunited the country. In 1738 the "Afshar" dynasty was born through Nader who proclaimed himself the Shah of Iran. Soon afterwards he waged a war against the Afghans (Pashtuns) and captured Kandahar. He was a brilliant military strategist who defeated the Ottomans, Russians, Indians and various local tribes. Two of the world's greatest diamond pieces, Sea of the Light (now in Iran) and Mountain of the Light (Part of British Crown Jewels) were captured by Nadir Shah in his invasion of Mughal India. Nader Shah’s military machine collapsed following his assassination by his own guardsmen. 1747-1779 --Karim Khan Zand gained control of central and southern parts of Iran. He was a compassionate ruler who refused to assume the title of Shah and referred to himself as the Representative of the People. He fought extensively with a rival tribe, the Qajars. 1795 --After Karim Khan Zand's death in 1779, Aqa Mohammad Khan Qajar gradually vanquished the Zands and established the Qajar dynasty. He succeeded in reuniting the country. But he was a brutal and generally weak and corrupt ruler. The economic and military gap between Iran and the West widened considerably under their reign. England in thirst of expanding her colonialism from India to Iran; especially in light of the Industrial Revolution that was taking place in the West, she influenced Qajar rulers. Although Qajar period enjoyed a high degree of artistic excellence, producing some of Iran's finest paintings, tile-works and architectural monuments, but subsequently lost control of major part of the country and surrendered it to the strangers. 1813 - 1828 --Qajar weakness resulted in English and Russian penetration in Iranian affairs. The Qajars lost the Caucasus (present day Georgia, Armenia and part of Azerbaijan to the north of Aras River) to the Russians in two separate treaties: the Gulistan in 1813 and the Turkmanchay in 1828. As a result of the 1828 treaty, the Qajars were forced to enact the "Capitulation" law, exempting all foreign citizens from Iranian jurisdiction. This law deeply humiliated the Iranian people. 1848--Mirza Taghi Khan Amir Kabir was the young prince Nasser-e-Din's advisor and constable. With the death of Mohammad Shah in 1848, Mirza Taqi was largely responsible for ensuring the crown prince's succession to the throne. When Nasser-e-Din succeeded to the throne, Amir Nezam was awarded the position of prime minister and the title of Amir Kabir, the Great Ruler. Amir Kabir, tried to introduce many reform initiatives but was assassinated by his corrupt enemies within the court, ­a fate shared by an earlier reform-minded prime minister of the Qajars. One of the greatest achievements of Amir Kabir was the building of Dar ol Fonoon, the first modern university in Persia and the Middle East. Dar-ol-Fonoon was established for training a new cadre of administrators and acquainting them with Western techniques. Amir Kabir ordered the school to be built on the edge of the city so that it could be expanded as needed. 1851-1906 --Following a conspiracy played between Russians and England the corrupt Qajars lost central Asian provinces to the Russians and were forced to give up all claims on Afghanistan to the British. These two powers dominated Iran's trade and manipulated its internal politics. The Qajars and influential members of their court were bribed to sell many valuable concessions to the British, such as the oil and Tobacco Concessions. 1906 -- Qajar's deep corruption and mismanagement led to the Constitutional Revolution and the establishment of Iran's first parliament or Majles. Britons helped clergies pushing for Constitutional Revolution in order to keep Russians out of Iran's internal affairs. The constitutional aspirations for a limited monarchy were never to be fully realized. Although Iran never became an actual colony of imperial powers, in 1907 it was divided into two spheres of influence. The north was controlled by Russia and the south and the east by Britain. By the end of WW I, Iran plunged into a state of political, social and economic chaos. 1921 --Reza Khan, an officer in the Qajar army, who was called to Capital to keep law and order, following removal of some British personnel, he unexpectedly staged a coup. Initially the minister of war and then the prime minister. His plan was to establish a republic but under tremendous force by clergies and influenced high class in fear of diminished role in the new concept; in 1925 Reza Khan became the Shah himself. 1925-1941 --In 16 years Reza Shah Pahlavi turned Iran around 180 degree, from a bankrupt economy to an industrial one, because his first priority was to strengthen the authority of the central government by creating a disciplined standing army and restraining the autonomy of the local revolting chiefs. His passion to modernize, separate, break and diminish religion from governing power (secular reforms), establish an educational system that is distanced from religion, and a judicial system that is based on modern laws rather than clerical rules, all triggered both mullahs and Britons that had close relations with each other. Iran's first modern university, schools for females and bringing women into the work force exhibit his work as a great revolution toward emancipation and development. Iran's first industrialization program, dramatically improved infrastructure by establishing modern army, navy, air-force, building numerous roads, bridges, state-owned factories etc. could not have been achieved without Reza Shah's passion for Iran. Despite frequent bugs and annoying discussion by Mossadeghas member of Parliament, preventive and or deviating Reza Shah to a project that better suit Britons for a railroad from east to west connecting two colonies of England -Iraq&Pakistan- Iran's first Transnational railway was built by Reza Shah from North to South. In 1935, he officially requested all foreign governments to no longer refer to Iran as Persia, but as Iran. (The Iranian people themselves had always referred to their country as Iran.) Reza Shah abolished the wearing of the veil, hence liberating women, a unique gesture that no other Middle Eastern country brought forward, except for Turkey under Attaturk. Several years following the building of Rail Road, in the outbreak of WWII he chose to remain neutral, but this fell to the deaf ears of Allies who invaded Iran from north and south. This ended Reza Shah’s reign. 1941 -- Allies occupation lasted for the duration of WWII to supply Soviets with wartime materials by using Trans-Iranian Railroad. They confronted Reza Shah who was forced to abdicate in favor of his son Mohammad Reza Pahlavi. He was promised to head for Bombay, but was taken to exile in South Africa. He died in South Africa in 1944. 1946 --Mohammad Reza Shah refused to sign separation of our Soviet occupied Azarbaijan. Under American pressure, the Soviet Union was forced to pull out of Iran's northwestern province. 1951- 1953 -- Under influence by Britons, acting member of Parliament, Mohammad Mossadegh persuaded Iran's Majles passing a law sponsored by him (soon to be prime minister) and several friends nationalized Iran's oil favored Britons although sounded revealing from British control. The British, enraged into their oil concessions, treated as only remaining foreign entitled to such concessions, although theatrically froze all of Iran's Sterling assets and took their case to the International Court of Justice. The Court ruled in Iran's favor. The British government placed a total trade embargo on Iran and enforced it with their navy, leading to the collapse of Iran's economy. Thanks to Mossadegh, an opportunity for Iran's oil sold in a competitive market between American, Soviet Union and Britons etc., monopolized for British only. Citing the threat of a communist takeover, failed sponsored plan by British Intelligence and the CIA to topple Dr. Mossadeq's government took over by the people and national army. In the midst of the events, the young Shah, left the country. Shortly thereafter, following departure of CIA officer and release of his men to Baghdad, Dr. Mossadeq's government was overthrown by the people and army personnel and the Shah came back. 1962-1963 -- Major Land Reform, workers right, women's right to vote and other initiatives were introduced by Shah during his White Revolution. Shah's reform triggered clergies and feudal landowners. In a series of public speeches, Ayatollah Khomeini attacked these reforms. He was arrested and then sent to exile. 1963-1973 –Following Reza Shah’s revolutionary modernization of Iran, his son Mohammad Reza Shah Pahlavi brought a rapid economic growth and prosperity coupled with a relatively stable political climate into Iran, a situation that was never experienced before. Iran's infrastructure, public health and educational institutions were expanded. Massive projects of highways, railroad, underground train projects, roads, bridges, water and sewage projects, factories, schools, universities and hospitals were built. Iran's military strength grew and its international prestige was enhanced. 1973-1979 --The oil embargo by Arabs during Arab-Israel conflict quadrupled Iran's oil revenue. Iran under the guidance of Mohammad Reza Shah, became master of OPEC. Oil Producing Countries’ wealth augmented thanks to Shah's guidance. Shah's timetable to make Iran to catch up with the West, alarmed Europeans and Oil companies. The Shah's determination to modernize Iran virtually in a shortest possible time at any cost, led to a global shock. Certain leftists in collaboration with outside organizations infiltrated key positions, masses influenced, inflation irrupted, corruption emerged, economic bottlenecks, massive urbanization, rising expectations and increasing preventive pressure on the government from outside, in addition to the social, economic and political problems started to emerge by the end of 1978. Paid opponents, of all political affiliations, united behind Ayatollah Khomeini who was chosen by Oil giants following British introduction. People's incompetence, coarse decision, ignorance of patriotism, listening to outside destructive stories broadcast by foreign radios caused the overthrow of Shah in 1979. Later, they called this chaos “Islamic Revolution” which was conspired and played by all parties funded and guided from outside. Shah vigorously fought cancer and died in Egypt a year later. After 2,500 years of monarchy, despite forceful suggestion of clergy to change Reza Shah's decision, clerics changed Iran's government to a theocratic republic; hence, the Islamic fundamentalism. 945-1055 -- بغدادپايتخت اسلام بوسيله بويه که از شمال مرکزی ايران آمده بودند تسخير می شود. پائين آوردن نقش خليفه به درجه يک رهبر مذهبی تنها بنيان کاری را گذاشت که در قرن نوزده و بيست ويک آثار گرفتار کننده آن ظاهر می شود. تقريبا به مدت يک صد سال قدرت سياسی در دست آل بويه قرار داشت. 1092 -- از يک نژاد ايرانی نبود، ولی حکومتی در ايران بوجود آمد که برای ايران بود، ملک شاه سلجوقی دودمان خود را با ياری و مشاورت وزيری ايرانی آغاز کرد بنام نظام الملک. او دوران جديدی در تاريخ ايران گشود. نظام الملک با رهنمود های خويش شاه را کنترل می کرد و در واقع بيشترين پوشش منطقه از سوريه تا افغانستان زير نفوذ او قرار داشت. نظام الملک نگارنده کتاب نامی -سياست نامه- است که سيستم سياسی و اداری و حکومت را در يک استاندارد بالا آموزش می دهد. در اين کتاب نحوه تصميم گيری، دادگستردن، ميانجيگری، محدوديت ها مورد بحث قرا می گيرد. او مدرسه نظاميه را گشود که در آنها سياست و دانش های ديگر آموزش داده می شدو فکر مردم را بالا ميبرد. غزالی و خيام از او تبعيت می کنند. 1048-1122 -- رياضيات، ستاره شناسی، شاعری، نويسندگی خـُبرگی دانستنی های عمر خيام را تکشيل می دهند. خيام با محاسبه بسيار دقيق گاهنامه جهانی را تنظيم کرده است. به ياری او رسد خانه ای در اصفهان ساخته شد. رباعيات فيلسوفانه او چنان اعتباری بدست آورد که يک انگليسی بنام فيتزجرالد در قرن 19 آنرا را به انگليسی برگردان کرد. اشعار خيام در اطراف عشق و فرزانگی دور می زند. رباعيات خيام تا کنون به چندين زبان برگردان شده است. 1058-1111-- غزالی به عنوان يکی از پيشروان فلسفه و منطق است که بحث های جالبی در مقوله هستی وجود، عرفان و مقولات مربوط به روح و الهام وعرفان دارد. غزالی و ابن سينا (ابوعلی سينا) دو نظريه متفاوت ارائه می دهند. صوفی به رسيدن به ژرفای موضوعات عشق می ورزد، همچنين به ربانيت و همدلی با خدا از راه عبادت و گاهی تفکر، انديشه درون و تسلط و تصرف جانی پرداخته است او سخت تلاش کرده است به اين انديشه والا برسد. 1206 -- تيره های مغول توسط چنگيز خان متحد شدند و قصد کردندتا جهان را تسخير کنند. 1220 -- کشتار، آتش سوزی، کشتار همگانی، وحشيگری، نابودی که نظير آن ديده نشده بود با پيشروی چنگيز خان وايل و تبار او به ايران آمد. يکی از بلاهای ناگهانی که در تاريخ بشريت رخ داده است. در نتيجه اين حمله و يورش ناگهانی استان های شمالی ايران بشدت نابود شد. هلاکوخان تقريبا همه شهر های سر راه را از بين برد، کتابخانه ها، بيمارستان ها و تقريبا تمام مردم شهر ها را بصورت کشتار جمعی از بين برد. تعداد کشته شده ها به ميليون ها می رسيد. اما همه ايرانيان و ايران نمرده بود وهمه مشغول شدند و مغولان را تغير دادند تا ساختمان های نابود شده ربجای اينکه خراب کنند از نو بسازند. 1227 -- امپراتوری نابود و تقسيم شده چنگيز خان بين پسرانش قسمت شد. 1258-1353 -- خليفه گری عباسیان با تسخير بغداد از سوی مغولان به پايان رسيد 1258. دودمان ايلخانی کنترل بخش بزرگی از بازمانده های مغولان را بصورت امپراتوری ايران اداره کردند. 1271 -- سفرنامه مارکوپولو که در راه خود به چين نگاشته شده به ترکتازی، وحشيگری، و خشونت مغولان اشاره دارد. بار ديگرتجاوز و تهاجم، مرگ، و خرابی تازی =عرب به سراغ ايران در حال پيشرفت آمد. 1207-1273-- خالق مثنوی بزرگترين شاعرعرفانی ايران که يک صوفی تمام عيار و يک فيلسوف بود بنام رومی شاهکاری می آفريند. پدرومادر او از ترس مغولان به آناتوليا (ترکيه) پناه می برند. فلسفه و شعر مولوی بطور گسترده ای در جهان تاثير گذاشته است. اشعار پر مغز و معنی او به خدای درون در نيروی درون بشر اشاره دارد و افراد را به درونگرائی و عرفان تشويق می کند. 1274 -- يکی از رسد خانه های مشهور و مهم در مراغه از استان آذربايجان در دوران نصيرالدين توسی بدنبال تجاوز اعراب و مغول ها ساخته شده است. او به عنوان يک ستاره شناس، فيلسوف با محاسبات رياضی ويژه ای برای نشان دادن گردش زمين بدور خورشيد وکرويت آن اندازه ها و معادلاتی را ارائه می دهد کی بی نظير هستند. کار های او بعد ها به زبان های لاتينی ترجمه شده است و برخی از آنها برای 200 سال بنياد افکاری را گذاشت که وقتی کپرنيک با الهام از نصيرالدين ارائه داد به نام او ثبت شد، او به مرکزيت خورشيد در منظومه خورشيدی اشاره دارد. 1213-1292 -- دو نسک (کتاب) عمده ادبيات توسط شاعری که به سفر علاقه داشت، فيلسوف و پژوهشگر سياسی بود بنام بوستان و گلستان از سوی سعدی نوشته شده. او با استفاده از واژه ها و اشعار معنی داری نفوذ زيادی بر فرهنگ هند و آسيای مرکزی و همچنين ايالات متحده آمريکا و سازمان ملل گذاشته است. اشعار او بر همبستگی و وابستگی انسان ها بدون توجه به مليت و نژاد و مذهبشان تاکيد می کند.آنچه در بالا آمد نماد سازمان ملل است که به همبستگی و هم پيمانی بشريت اشاره دارد. نگاره زير بر گورش کنده شده است: ز خاك سعدي شيراز بوی عشق آيد -- هزار سال پس از مرگ او گرش بويی. (در اصل غزل آمده است: زخاک سعدی بيچاره بوی عشق آيد -- هزار سال پس از مرگش ار به يـَنـبويی). 1295-- همانطور که در ايران رسم بوده است بيگانگانی که در ايران دولتی برپا کردند با زيرکی ويژه ايرانی برگردانده شده اند تا سنت های ايرانی را بجای آورند زيرا فرهنگ و ادبيات ايران تا آن اندازه قوی بوده است. غازان خان اولين حکمران مغول از طايفه ايلخانی که بنام ايران حکمرانی کرد اسلام را پذيرفت. پيش از او يونانيان و اعراب و ترکان متجاوزرانامبرديم که "ايرانيزه" شده بودند. سپاس به وزير دانشمندغازان خان؛ رشيد الدين که خرابی های مغلولان پيشين را آباد کرد. جامع التواريخ که به تاريخ جهان اشاره دارد توسط رشيد الدين نگاشته شده است که پر است از انديشه های سياسی که در کوتاه زمان زندگی خان مغول را به شکوفانی می رساند. در دوران امپراتوری مغولان افکار و کالا های زيادی با چين و هند مبادله شده است. 1320-1390 -- سيرت زيبا، عشق، بشردوستی، فلسفه و دانستن عربی تاثير فراوانی در کتاب حافظ شيراز گذاشته است که يکی از شاعران بزرگ ايران است. 1339-1432 -- جلايری ها که خود يکی از نواده های مغولان بودند در باختر ايران در بخشی از مرز عراق حکومت کردند. سلطنت جلايرتی ها نزديک به پنجاه سال به درازا کشيد تا اينکه بدست تيموريان که از "ترکان قره قويونلو - گوسپند سياهان" بودند منقرض شد. پس از تيموريان با مرگ تيمور در سال 1405 جلايريان دوباره تلاشی برای باز گشت به سلطنت کردندکه نا موفق باقی ماند. 1405-- تيمور (تيمور لنگ) از دودمان تيموريان به دوران مغولانی می رسد که پس از تسخير آسيای مرکزی در ترکستان مستقر شدهب با مغولان هم پيمان شده تباری بنام بيرلاس را تشکيل دادند، بيرلاس ها در ترکستان مستقر شدند و بطور عميقی با ترکان محلی آميخته شدند و نسل ترک زبان را شيوع دادند. رهبر ترک و مغولان بيشتر مناطق ايران را به تسخير در آوردند. گرچه بسيار خشمگين و خشن بودند ولی علاقه زيادی به هنر داشت. سمرقند پايتخت او پر شد از هنرمندانی که از سرتاسر ايران به آنجا آورده شده بودند. بدنبال مرگ او امپراتوری او پراکنده شد اما بازماندگانش بخش های گوناگونی از ايران را به مدت يک سده اداره کردند. 1429 -- امتياز اولين ماشين حساب را می توان به جمشيد کاشانی داد. او رياضيدانی ماهر بود که شمارش و تئوری های پيشرفته ای را ارائه کرد که در سمرقند با ستاره شناسی همراه بود. 1407-1508 -- قره قويونلو ها و آق قويونلو ها بر بخش بزرگی از ايران سلطنت کردند. 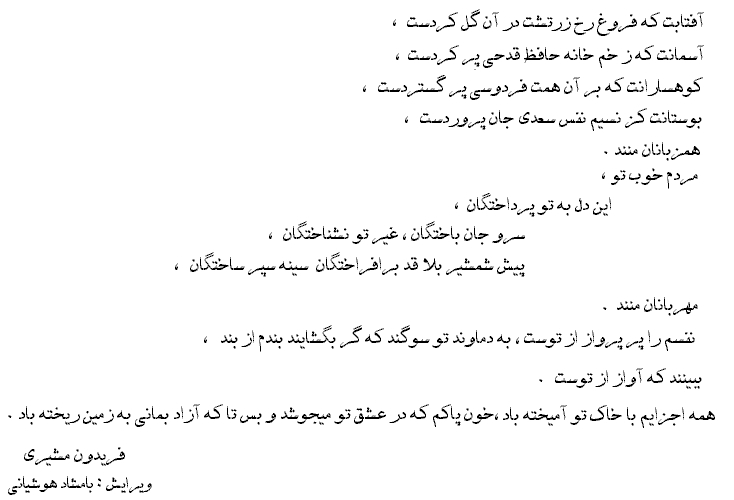 1501-1524-- پس از نزديک به نه سده خان خانی و پراکندگی در دودمان های ايرانی شاه اسماعيل اول ايرانيان را در زير يک رهبری متحد کرد. او رهبری شيعه را بخود اختصاص داد و شعيه را مذهب رسمی کشور کرد، تقريبا با زور همه ايرانيان و همسايگان ايران را که در تحت کنترل خود داشت مسلمان شيعه گردانيد. اينکار او همه ايرانيان را از ديگر بخش های جهان که به اسلام اعتقاد داشتند متمايز کرد؛ به ويژه با سنی های عثمانی. شاهان صفوی در مجموع مذهبيون شيعه را در حمايت خود گرفتند. 1587-1629 -- اوج شکوه صفويه در دوران شاه عباس بود. او ارتشی منظم و فرمانبردار گشود که عثمانيان را شکست داد. در سال 1598 اسپهان (اصفهان) را پايتخت خود کرد. اوبه هنر بسيار اهميت می داد به ويژه به معماری؛ باين ترتيب اسپهان را با ايجاد بنا های جديد بصورت هنرمندانه ای آراست. او تعدادی مسجد، مدرسه، و پل و بازار در اسپهان ساخت که در جهان نمونه است. نقاشان و هنرمندان ايرانی تشويق شدند تا بهترين اثرات خود را در دوزندگی، چينی سازی، کاشی کاری، آهنگری، نقاشی، خطاطی و مينياتور و فرش ارائه بدهند. 1501-1722 -- عثمانی ها در آناتولی و مغولان در هندوستان دو دولت مسلمانی که هم زمان با ايران بودند به هنرمندان ايرانی در رشته فرهنگ و زبان و نقاشی نيازمند و متکی شدند. زبان پارسی زبان اول اين دو سرزمين شد. نگارش ها، ميناتورها، قوانين دادگاه ها، نقاشی، ترجيحا به زبان پارسی نوشته شدواز فرهنگ ايرانی تاثير گرفت. هندوستان همچنين هنر کشورداری و فرهنگ را از ايران بهره برد گرچه بعد ها توسط انگلستان بصورت مستعمره ای در آمد. يک آرشيتکت (معمار) ايرانی بنام استاد اسد تاج محل را که از معماری ايرانی ارث برده است را در هند ساخت. 1722 -- يک دلاور وفرمانده از خطه افغانستان بنام محمود خان (محمود افغان) که جزو خاک ايران بود در دوران شاه سلطان حسين دودمان صفوی را تقريبا بدود جنگ منقرض کرد. 1729-1747 -- نادر شاه، که افسری از لشکريان صفوی بود افغان ها را از ايران بيرون راند وکشور را متحد کرد. در سال 1738 دودمان "افشار" با پيدايش نادرکه خود را شاه خوانده بود زايش يافت. بزودی او جنگی برعليه افغان ها (پشتون ها) اعلام کرد و قندهار را تسخير کرد. او استراتژيست بالا مقام و هوشمندی بود که توانست عثمانی ها را هم به زانو در آورد. همچنين روس ها، هنديان و بسياری از دسته های و طوايفی که سربه شورش گذاشته بودند را تارومار کرد. دو نمونه از الماس های بی نظير جهان دريای نور (حالا در ايران) و کوه نور (بخشی از جواهرات انگلستان) را پس از تسخير موقال هند با خود آورد. ماشين جنگی نادر شاه بدنبال قتل او بدست يک افسر از لشگريان خويش از کار افتاد. 1747-1779--کريم خان زند کنترل جنوب ايران در ناحيه پارس را بدست گرفت.او فرمانروای مهربان و دلسوزی بود که حتا حاضر نشد نام شاه بر خود بگذارد؛ او خود را وکيل الرعايا لقب داد و بطور گسترده ای با طايفه قاجار جنگيد. 1795 -- پس از مرگ کريم خان زند در سال 1779 آقا محمد خان قاجار کم کم دودمان زند را منقرض کرد و دودمان پادشاهی ديگری بنام قاجار استوار کرد. او موفق شد کشور را بصورت متحد در بياورد. اما او فرمانروائی ضعيف در تصميم گيرهای خود فاسددر نوع زندگانی و رفتارهايش بود. فاصله بين اقتصاد و نظاميگری ايران و غرب در دوران قاجار فاصله زيادی باز کرد. ولع و تشنگی انگلستان به گستردن نفوذ خويش در سرزمين های تحت سلطه از هندوستان تا ايران بر ايران فشار می آورد. به ويژه در سايه انقلاب صنعتی که در اروپا در حال شکل گيری بود انگلستان نفوذ خود بر قاجار ها را افزود و فشار می آورد. گرچه دوران قاجار همراه با شايستگی های هنری همراه بود و نقاشی های ظريف و پر ارزشی بوجود آورده است ولی در همين راستا بخش بزرگی از سرزمين های خود را به بيگانگان واگذار نموده است. 1813-1328 -- ضعف و بی عرضگی دودمان قاجار تسلط و نفوذ انگلستان و روسيه را بر ايران افزايش داد. قاجار ها قفقاز (گرجستان فعلی، ارمنستان و بخشی از آذربايجان و بخش عمده ای از شمال رودخانه ارس) را در طی دو قرار داد ننگين جداگانه به روسها واگذار کردند. گلستان در سال 1813 و ترکمنستان در سال 1828. در نتيجه قرار داد 1828 قاجار ها مجبور شدند تا سيستم "کاپيتولاسيون" را در ايران جاری سازند که قانونی بود مبنی بر عدم محاکمه بيگانگان در دادگاه های ايرانی. اين قانون بشدت ايرانيان را شرمسار و سرافکنده می کرد. 1848-- ميرزا تقی خان امر کبير وزير و مشاور شاهزاده جوان ناصر الدين شاه بود. با مرگ محمد شاه قاجار در سال 1848 ميرزا تقی بطور گسترده ای مسئول اداره کار های شاهزاده جوان بود که به جای پدر به سلطنت رسيده بود. وقتی ناصرالدين شاه به تخت سلطنت نشست امير نظام را حکم وزارت و لقب امير کبير داد. امير کبير بسيار سخت کوشيد يک رفرم و تحول اجتماعی در ايران بوجود آورد اما قتل نا جوانمردانه او که از سوی دشمنان فاسد و پشت به ميهن کرده که برخی از آنها در دربار بودند تدارک ديده شده بود به او امان نداد. يکی از شاهکار های امير کبير ساختن دارالفنون بود که اولين دانشگاه مدرن ايران و خاور ميانه به حساب می آيد. دارالفنون تشکيل شده بود تا کادر جوان را برای مديريت های کشوری آموزش بدهدو آنها را با داده های مدرن غرب آشنا سازد. امير کبير فرمان داد تا مدرسه هائی در اطراف شهر طوری ساخته شوند که قابل گسترش باشند. 1851-1906 -- بدنبال توطئه ای که با همکاری روس و انگليس درايران به اجرا در آمد قاجار های فاسد و بی مصرف استان های آسيای مرکزی را به روسها باختند و مجبور شدند اختيار خود بر افغانستان را هم از دست بدهند و آن بخش در اختيار انگليس قرار گرفت. اين دو قدرت بزرگ تجارت و سياست های داخلی کشور را در اختيار خود گرفتند. بی عرضگی قاجار ها و دخالت های افراد درباری از درون که به راحتی رشوه می پذيرفتند امتياز های زيادی از جمله امتياز تنباکو و نفت را به انگليس واگذار کردند. 1906 -- با وجود فساد و مديريت غلط در دوران قاجار آن دوران به يک انقلاب مشروطه منتهی شدد که اولين پارلمان يا مجلس را تشکيل داد. انگليس آخوند ها را زير فشار قرار داد و کمک کرد تا انقلاب مشروطه رخ دهد زيرا با اينکار می خواست روسيه را از دخالت در امور داخلی ايران کنار بزند و خود يکه تاز باشد. آرزوی واقعی انقلاب که همانا محدود کردن قدرت پادشاهی بود هيچگاه ميسر نشد. گرچه ايران هرگز به صورت يک تحت الحمايه (کولونی) امپراتوری قدرتمند آنزمان در نيامد ولی در سال 1907 ايران به دو منطقه نفوذ تقسيم شد. شمال در کنترل روس ها و جنوب و شرق کشور در تحت نفوذ انگلستان بود. در پايان جنگ جهانی اول ايران در يک وضع اجتماعی-سياسی بسيار ناگوار ويک وضعيت اقتصادی غم انگيز دچار آمد. 1921 -- رضا خان که در دوران قاجار يک افسر ارتش بود بدنبال خارج شدن برخی از نظاميان انگليس از ايران به پايتخت فرا خوانده شد تا نظم را برقرار کند که بطور ناگهانی کودتا کرد. ابتدا به عنوان وزير جنگ و سپس به عنوان نخست وزير خدمت کرد. برنامه او اين بود که يک جمهوری تشکيل دهد ولی براثر فشار های بی حد مذهبيون (ملايان) و طبقه بالای جامعه از ترس اينکه نقش آنها در سيستم جديد مخدوش شود مجبور شد در سال 1925 خود را شاه بنامد. 1925-1941 -- در زمانی نزديک به 16 سال رضا شاه پهلوی ايران را 180 درجه از يک کشور ورشکسته، اشغال شده به يک کشور صنعتی وپيشرفته . مستقل مبدل کرد زيرا اولين برتری در برنامه اوبالا بردن قدرت حکومت مرکزی، نظم و ديسيپلين و کاستن از بی نظمی و خودمختاری شورشيان منطقه ای بود. فکر مصمم او مبنی بر مدرن کردن زندگی مردم، جدا کردن، تکه پاره کردن و کاستن نفوذ دين از دخالت در سياست (رفرم سکولار) استقرار يک سيستم آموزشی که از دين و مذهب فاصله داشته باشديک روش دادگستری غير مذهبی و مبتنی بر قوانين مدرن پذيرفته شده، همه يکجا باعث شد ملايان و پشتيبان بيگانه آنها انگلستان را خشمگين کند. اولين دانشگاه مدرن، موسسات آموزشی برای بانوان و شريک کردن بانوان در نيروی کار کشوربنيان روش اداری او بر يک انقلاب واقعی در جهت رستگاری، آزادی و پيشرفت و پويائی بود. اولين برنامه صنعتی شدن ايران چهارچوب زندگی ايرانی را به جهت پيشرفت تغيير داد و اجازه داد ارتش مدرن، نيروی هوائی و دريائی مدرن، جاده، پل، کارخانه های ملی، ايجاد شود که بدون عشق رضا شاه به پيشرفت و پويائی امکان پذير نبود. با وجود نطق ها و اعتراضات ناراحت کننده و مزاحمت های مصدق و برخی از نمايندگان مجلس به منظور چرخاندن پروژه رضا شاه در جهتی که منافع انگليستان حفظ شوديا راه آهن از باختر به خاور کشيده شود تا مستعمره های انگلستان در عراق و پاکستان را بهم وصل کند ويا از آنجلوگيری شود، معهذا رضا شاه اولين راه آهن سرتاسری رااز شمال به جنوب ساخت. رضا شاه در سال 1935 از همه کشور های بيگانه درخواست کرد تا ديگر به ايران بصورت پرشيا خطاب نکنند و نام باستانی آن يعنی ايران را بکار برند. (ايرانيان خود هميشه ايران را با نام ايران می خواندند.) رضا شاه از پوشش حجاب بانوان جلوگيری کرد، که به آزادی بانوان منجر شدکه در نوع خود بجز مورد ترکيه در حکومت آتاتورک در خاور ميانه بی نظير بود. چند سال پس از ساخت راه آهن سرتاسری جنگ دوم جهانی آغاز شد، او تصميم گرفت بی طرف بماند اما اين اعلام بيطرفی به گوش هپيمانان (متفقين) نرفت و ايران را از شمال و جنوب اشغال کردند اين کار به سلطنت رضا شاه پايان داد. 1941 -- اشغال هم پيمانان جنگ جهانی دوم برای رساند تدارکات با استفاده از راه آهن سرتاسری به روسيه ادامه يافت. آنها با رضا شاه مقابله کردند و مجبورش نمودند تااز ايران خارج شود؛ درنتيجه پسرش محمد رضا پهلوی به پادشاهی رسيد. او را به مقصد بمبی از ايران بردند ولی به تبعيد سر از آفريقای جنوبی در آورد. رضا شاه در سال 1944 در آفريقای جنوبی درگذشت. 1946 -- محمد رضا شاه از امضای جدائی آذربايجان که در تسلط روس ها بود خودداری کرد. بر اثر فشار آمريکائی ها اتحاد جماهير شوروی مجبور شد ايران را ترک کند. 1951-1953 -- بر اثر فشار بی امان انگلستان، نماينده مجلس ايران محمد مصدق، مجلس را متقاعد کرد تا لايحه ملی شدن نفت که توسط او (که پس از آن به نخست وزيری رسيد) و چند تن از دوستانش ارائه شده بود امضا شود، اين کار گرچه اينطور وانمود شده بود که برعليه انگلستان است ولی به نفع بريتانيا تمام شد و آنها را همچنان در کنترل نفت باقی گذاشت. بريتانيا به عنوان تنها منازع بر سر قراردادهای امتياز نفت باقی ماند گرچه بطور نمايشی ذخيره های ليره استرلينگ ايران را مسدود کرد واعتراض خود را به دادگاه بين المللی لاهه برد. دادگاه لاهه به نفع ايران رای داد. دولت بريتانيادست به يک تحريم اقتصادی زد و با نيروی دريائی خود ايران را از لحاظ اقتصادی محاصره کردو تا لبه پرتگاه پيش برد. باين ترتيب با تلاش مصدق درهای بازار رقابتی که می توانست بين آمريکا، روسيه و بريتانيا و ديگر کشور ها برای ايران بوجود بيايد بکلی بسته شد و در انحصار انگليس قرار گرفت. نگرانی از بر سرکار آمدن يک حکومت وابسته به کومونيسم، طرحی که توسط سازمان اطلاعاتی انگلستان و سيا برای برکنار کردن مصدق ريخته شده بود شکست خورد ومردم با همکاری ارتشيان ميهن پرست اختياراداره کشور را بدست گرفتند. درميان اين وقايع شاه جوان ايران را ترک کرد، ولی مدتی نکشيد درحاليکه مامور سيا و همکارانش ردنبال شکست ايران را ترک کرده بودند و در بغداد بسر ميبردند دولت مصدق به دست مردم ايران و ارتش ملی ايران سرنگون شدوشاه به کشور بازگشت (1953). 1962-1963 --اصلاحات ارضی، حقوق کارگران، حق زنان برای رای دادن، و بسياری ابتکارات ديگر از سوی شاه در هنگام انقلاب سفيد برای رفاه مردم پيشنهاد شد. رفرم و اصلاحات شاه ملايان و ملاکان را عصبانی کرد. در يک سری سخنرانی ها آيت الله خمينی به اين اصلاحات و پروژه ها حمله کرد. او دستگير شد وتبعيد شد. 1963-1973 -- بدنبال برنامه های مدرنيزه کردن ايران از سوی رضا شاه، پسرش محمد رضا شاه پهلوی پيشرفت های اقتصادی فراوانی برای شکوفائی همراه با فضای سياسی استوار به ايران ارمغان آورد، اوضاعی که هرگز تا آن تاريخ در ايران سابقه نداشت. پايه ها و بنياد برنامه های عمرانی ايران، آموزش همگانی، بهداشت مجانی، آموزشگاه های عالی، گسترش يافت. برنامه های گسترده و پراکنده وسازندگی، شاهراه ها، راه آهن، قطار زير زمينی، پروژه های راه سازی، پل سازی، آب و فاضل آب، کارخانه ها، مدرسه، دانشگاه، و بيمارستان های زيادی ساخته شد. ارتش ايران دارای قدرت و پرستيژی شد که همه جا ديده می شد. 1973-1979-- در هنگامه تحريم نفت از سوی کشور های عرب در بحران بين اسرائيل و اعراب، قيمت نفت چندين برابر شد و درآمد ايران از نفت افزايش يافت. ايران زير رهبری محمد رضا شاه پهلوی مبتکر وفرمانروای اوپک شد. کشور های توليد کننده نفت به رهبری شاه به ثروت های کلان دست يافتند. برنامه های سازندگی شاه با کشور های غربی برابری کرد و اين مورد اروپائيان و شرکت های نفتی را نگران ساخت. پيشرفت ايران در يک چنين کوتاه مدتی به هرقيمتی که شده بود شوک بزرگی در دنيا بوجود آورد، دسته ای از چپ های سنتی با همکاری سازمان های نفوذی بيگانه که به شغل های کليدی دست يافته بودند بطور گسترده ای موجب فساد و تورم شدند و در نتيجه اقتصاد با تورم بازار به خطر افتاد و شهرسازی ها متوقف شد و انتظارات مردم بالا تر رفت و فشار های جلوگيرنده که از بيرون به دولت می آمدو افزون بر آن دردسر های اقتصادی و اجتماعی وسياسی که از بيرون دامن زده می شد منتهی به يک سری تظاهرات در سال 1978 شد. تمام مخالفانی که از بيرون کمک مالی می شدند، به پشتيبانی خمينی که از سوی انگلستان به شرکت های نفتی و بيگانگان معرفی و مامور شده بود آمدند. بی کفايتی و ناشايستگی مردم، تصميم های نابخردانه، بی اهميتی و چشم پوشی بر ميهن پرستی، گوش کردن به داستان ها براندازنده و خراب کننده بيگانگان و راديو های بيگانه، موجب برکناری شاه در سال 1979 شد. درپسين روز های چنين فاجعه ای آنرا "انقلاب اسلامی" خواندند درحاليکه باهمکاری و پشتيبانی مالی بيگانگان صورت پذيرفته بود. شاه که شديدا با سرطان دست و پنجه نرم می کرد يکسال پس از آن در مصر درگذشت. پس از 2500 سال شاهنشاهی دکانداران دينی با وجود اينکه رضا شاه را به زور به تخت سلطنت نشانده بودند حکومت پادشاهی را با يک جمهوری "خداسالاری" جايگزين کردند که بر پايه های اسلام خرافاتی استوار است.